Identification: Forewing upperside is greenish brown with curved dark lines and pinkish-white patches. 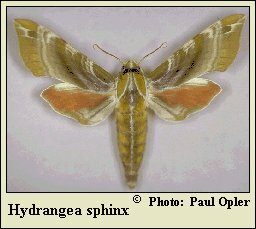 Hindwing upperside is pale yellow to reddish brown with white along the costal margin, greenish brown along the outer margin, and white shaded with greenish brown on the inner margin. Wing Span: 2 1/4 - 3 1/8 inches (5.8 - 8 cm). Life History: Eggs hatch about 7 days after they are laid. Fully-grown caterpillars pupate under leaf litter in loose cocoons of leaves and silk. Flight: . One brood; from June-July in the north, March-September in Louisiana, and February-July in Florida. Caterpillar Hosts: Smooth hydrangea (Hydrangea arborescens), buttonbush (Cephalanthus occidentalis), and waterwillow (Decodon verticillatus). Range: Maine south to south Florida, west to Illinois, Missouri, Arkansas, and Mississippi.